We ENJOY our work. We ENJOY helping our clients meet their objectives. We ENJOY working with each other. And we ENJOY sharing down time together. Every year we have a cultural "theme" in place to remind us of the bigger picture. This year's theme of ENJOY is inspired by Shawn Achor's book, The Happiness Advantage. The book is based on the premise that happiness fuels success, not the other way around. So we've focused our year on working through some of the principles in the book in an effort to re-orient our perspective - to harness our happiness and use it to fuel our work, our focus on family, our philanthropy, and our lives. Tasked with the difficult assignment of planning our annual retreat with ENJOY as a theme, Steven Reutter and Linda Mark put together a rigorous two-day adventure to the Barnsley Resort in Adairsville, Georgia. An ENJOYABLE day-one agenda included a lawn party featuring everything from corn hole and giant jenga to ladder golf. The day concluded with dinner and s'mores on the patio. Day two provided an equal level of ENJOYMENT, with paintball (easily the most popular event), horseback riding, and a scavenger hunt. 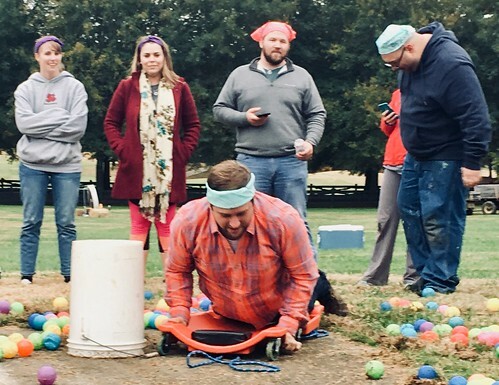 Afternoon team building activities capitalized on our competitive spirit, with a paintball shooting contest, adult trike riding, and hungry hungry hippos. So look out everyone: we've harnessed enough happiness to fuel us right through another terrific year of creating special places to work, heal, play and learn!